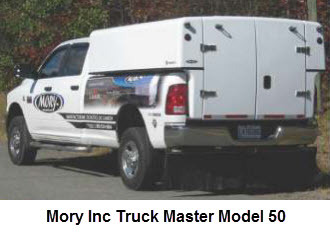 Mory Inc. is the Canadian manufacturer of the Master Truck Body. 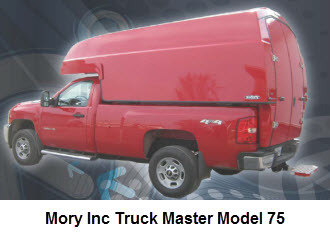 Family run since 1970, Mory Inc. manufactures fiberglass products like truck caps and raised roofs for vans. The Master Series Truck Body is made in 4 models (Master 50, Master 60, Master 75, Master 80) for both 8' and 6.5' bed length pickups. 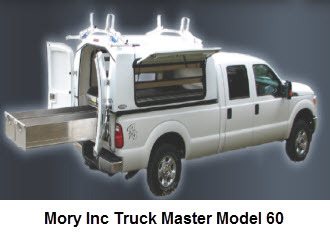 Each of the 4 models is interchangeable on any pickup of the same truck bed length. 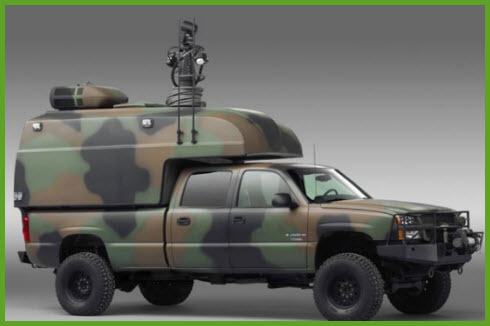 For example, if you buy a Master 75 model for an 8' Sierra, it will also fit an 8' F-150. Time to do the switch depends on how prepared you are, but can be as little as 30 minutes from one pickup to another. This means your investment in an expensive truck cap for your small business or your investment in a fleet is protected past the lifetime of your pickups. Wear out a truck, remove the Master Truck Body from the old truck and drop it into the new pickup. A patented lock down system makes the switch fast and efficient. Each of these truck caps has its' own floor, so the stuff you have piled inside moves when you switch to another pickup. What more can you ask for? Your investment is protected, if you don't like a GMC truck you can switch to a Ford truck and take the cap with you, the paint matches your pickups, you can get all kinds of doors, windows, shelves, ladder racks and sliding storage, and a lot more, Oh My!!! I guess all we can do is look at each model to see which one you need the most. I do want to make one comment first. 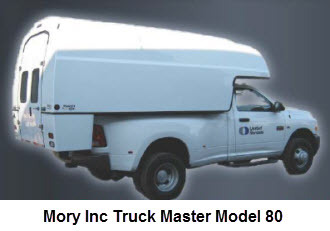 The MasterTruckBody website emphasizes the use of the Master Truck Body Series for commercial and government use. But, I think, this product line is a great fit for recreational use and for anyone who doesn't want to buy a new topper every time they buy a new pickup.